I found this worrying. I do not disagree with Wiesel with regard to there being no need to regret bin Laden’s death. But I do not think compassion is something to which people have a right. I believe compassion is a duty we owe ourselves, and that we should never cease to feel compassion for all sentient beings. Such compassion should not take away from the understanding that the death of one individual or another may be necessary so as to prevent further suffering. But inflicting death as a matter of justice or self-defence should never harden us to the need for compassion for our fellow human beings, and indeed for all forms of life. 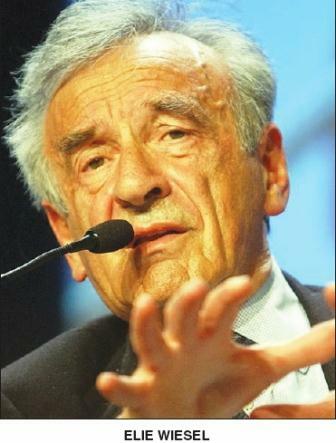 And I fear that Wiesel went further, in justifying other deaths, in a manner that suggested that a determination to destroy what has harmed us can have even more dangerous consequences for ourselves. He wrote that bin Laden ‘was not the only one put at risk by the American operation. There were others. Among them, children. And children are never guilty. Still, it was bin Laden himself who placed them in harm’s way’. That last sentence was horrifying. In the first place it seems to justify the killing of children in bin Laden’s vicinity, whereas surely the presence of children should have increased the need for caution. I do not think one can argue that no collateral damage whatsoever was acceptable, given the threat that was in theory presented by bin Laden. If, in the course of eliminating him, someone else who was innocent and helpless suffered, that does not put the deed beyond the pale. But the moral problem presented is not something that can be dismissed so easily, by throwing all the blame upon bin Laden for having children near him. Indeed, it seems preposterous to suggest that there was something unusual or culpable in bin Laden being surrounded by his own family. In a sense that detail makes one realize more thoroughly the moral problems raised by the decision to take out someone who had retreated to a domestic setting. Given that he still ran his network, one accepts the need to neutralize him, even to eliminate him, but the element of revenge involved stands out more starkly. And, even if the thirst for revenge is understandable in this case, given the magnitude of the destruction he had wrought, the extension of such revenge to children, even if it is argued that they were not the prime targets, and it was bin Laden’s fault to have them around him, seems to me utterly reprehensible. This type of thinking is dangerous. I can only hope that we in Sri Lanka do not accept such an approach, and glibly dismiss the deaths of some of the civilians who were taken hostage by the Tigers. In that case the hostage taking was deliberate, so the culpability of the Tigers was greater, but I am glad that we did not say it was all Prabhakaran’s fault and assume that we were justified in killing anyone he had placed in harm’s way. Fifty years ago, I remember a family holiday in Hikkaduwa, at the old Resthouse, which was torn down some years later to make way for the tourist hotels that now dot that area of the beach. It was my parents’ wedding anniversary, and they had taken us down for a much anticipated weekend. But early on the first morning, walking on the beach, I came across a fish out of the water, trying desperately to breathe, clearly weakening as every moment passed. I wanted to throw it back in, but my mother said it would serve no purpose. I think it was then that I realized, for the first time, how helpless we are in the face of life’s tragedies. I could do nothing to help, my mother whom I had assumed could solve all problems, was equally helpless. I think I said something about how unfair it was, and she said that life was like that. And though I soon realized that the death of a small fish is not a tragedy, the sense that something was wrong with life never left me. Nearly thirty years later, when the second JVP insurrection was at its height, and I was worrying about the fact that so many youngsters were being killed, my mother said something I found odd in someone whom I had never thought of as hard. She said that those who were terrorizing society – and I remembered how frightened she had been, when I once went to work when the JVP had ordered a hartal – had to be eliminated. It was sad, she said, but there was no alternative. Less than ten years later, I saw her dying, after an operation, and I had to leave her to go and tell my father and bring him to hospital, in time to be with her before the end. I thought at the time of the fish whose death we had both watched so many years previously and, though I realized it was an absurd memory to have carried over the years, I found it strangely comforting. There are certain things one has to accept, sometimes there are hard decisions that have to be made, but one must never lose one’s sense of compassion, one must never cease to think of what those who suffer are going through. Whether one feels they deserve it, or whether one feels they are innocent, the glib attribution of all agency to others, the denial of compassion, is a betrayal of one’s own humanity.